For an elegant Christmas, be sure the candles are lit, the pine is fresh, the wrapping is crisp and the soundtrack comes from Jo Morrison's Christmas Gifts. ... It all meshes together exquisitely, flowing from piece to mellow piece without pause or hesitation; left on repeat, this CD could play all evening and never grow tiresome. ... Unwrap this Christmas gift early and invite the Morrisons into your home for the holidays. You'll have them back again each year. These eighteen tracks contain the meaning of the season within them, and will bring joy to the heart of any listener. Seasonal music from around the world, all given a Celtic slant that renews the initial joy of the song. ... I find joy in the purity of the music itself where Christmas Gifts is concerned. 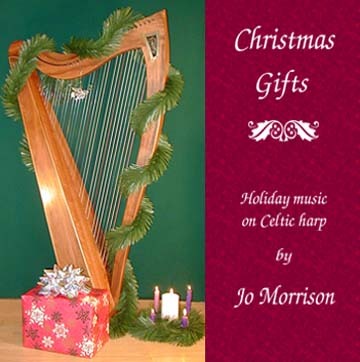 I would have to give this one a definite recommendation for anyone who likes seasonal music, harp music, or both. Jo's third release is not to be missed! Solo harp, plus three tracks by Port Righ, with Wayne Morrison on shuttle pipes. The first song is one of my favourites of the season, "What Child is This?" Jo gives it such a poignant feel that one can almost feel the wonder and amazement of the initial birth. The riffs and runs are smooth as silk, and bring a contented smile to the listener. © 2003 by Jo Morrison. All arrangements by Jo Morrison. * I Wonder as I Wander is copyright by John Jacob Niles, through G. Schirmer, Inc., licensed by the Harry Fox Agency, song number I00181, license number 1030831674. Engineered by Heidi Gerber at All Access Audio, Inc. Thanks to all of my fans who kept asking for this until I finally got around to doing it. Contact Jo for other shipping options. Artwork and packaging for Christmas Gifts by Jo Morrison. The album cover is Copyright © 2003 Jo Morrison, All rights reserved. All sound clips are Copyright ©2003 by Jo Morrison. All rights reserved. The cover and clips may not be used without permission. This web page is Copyright © 2003-2010 by Jo Morrison. All rights reserved.